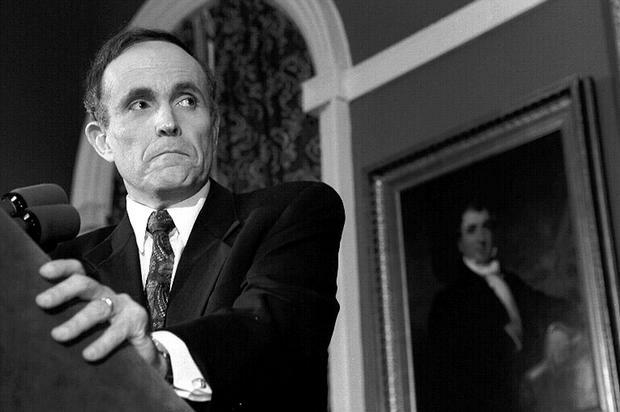 Mayor Rudy Giuliani at a 1994 news conference at City Hall. In 2001, Mayor Rudolph Giuliani wanted to allow five failing schools to be taken over by the for-profit management company Edison Schools. But New York state's charter school law required a vote by the parents. WNYC's Beth Fertig covered the controversy and won a du Pont-Columbia Award for digging into the bitter political campaign. The jurors noted, "Fertig lets all of the constituencies speak for themselves as she reports on the interplay of teachers, minority parents, school officials and Edison's public relations campaign. She explains why the vote was doomed to fail, despite the best intentions of everyone involved."